I was struck by the glaring differences between the candidates as they answered questions at the Basis School debate. Cheryl Cage answered in sound bites and generalities. Al Melvin answered with sources and facts. Ms. Cage repeatedly talked of closing $10 billion in tax credits and loopholes. After the debate, I asked Ms. Cage for a list of these tax credits and loopholes. After all, since she knew the amount she should have a tabulated list. Apparently not: Ms.Cage refused my request. On the topic of “all day kindergarten,” Ms. Cage lamented that all day kindergarten was not compulsory and that children were suffering, a typical progressive-socialist lament. She failed to state that there is credible research on both sides of the topic. It seemed as if she wanted her own opinion and her own facts. Sorry, Ms. Cage, you can have your opinion but you cannot have your own set of facts. In addition, Ms. Cage resorted to meaningless statistics in her answers. For example, she lamented that Arizona was last in per pupil funding at $9,200. This statistic is meaningless without framing it with qualitative data. At $9,200 per pupil, Arizona graduates 70% of its students on time. America’s Promise Alliance, in its study “Cities in Crises: Closing the Graduation Rate,” found that in the country’s 50 largest cities, which all fund students at higher levels than Arizona, the graduation rates are 53%. Arizona’s graduation rate of 70% is at the national average. The obvious conclusion is Arizona is more effective and efficient in graduating students on time. We can do better but it is not the doom and gloom picture painted by Ms. Cage. Ms. Cage, in attempting to explain away the doubling of the State General Fund budget from $5.5 billion to $11 billion under Governor Napolitano (2002-2008), flippantly responded that the reason the budget exploded was Arizona experienced 40% growth in its population. Not true. The United States Census Bureau shows that between 2000 and 2009, Arizona’s population grew by 28.6%, or 11.4% percent less than Ms. Cage’s 40% even adding three additional years. My analysis shows growth between 2002 and 2008 to be just under 19%. Once again, Ms. Cage is devoid of any facts. Regarding solar energy, Ms. Cage has stated that, “Studies have shown for every $1 million dollars invested in solar will provide 13.5 jobs to the nuclear industries 4.5 jobs.” I am a proponent of solar. I have solar on my house. What I am not a proponent of is mass solar installations that misuse the environment. Spain attempted to “go green” several years ago with dismal results. “For every new position that depends on energy price supports, at least 2.2 jobs in other industries will disappear, according to a study from King Juan Carlos University in Madrid . . .The premiums paid for solar, biomass, wave and wind power—which are charged to consumers in their bill – translated into a $774,000 cost for each Spanish ‘green job’ created since 2000, said Gabriel Calzada, an economics professor at the university and author of the report . . . The loss of jobs could be greater if you account for the amount of lost industry that moves out of the country due to higher energy prices . . .” I asked Ms. Cage on more than one occasion how she rationalized net job losses? She has yet to provide an answer. I firmly believe Ms. Cage is a nice lady but she cannot run on soap opera dramatics. Proposed policies must be based on facts not feelings. This is Ms. Cage’s weakness: she prefers her opinion over objective facts. I think this will be the cause of her loss to Senator Al Melvin. Keep AZ Drug Free, which urges a no vote on Prop. 203, held a press conference with Senator Kyl, Senator McCain, Congressman Shadegg, Congressman Franks, Maricopa County Attorney Romley and Yavapai County Attorney Polk. It was archived, in three parts, on YouTube. They’re linked below. Adding to the big government objections to Prop. 203, Gov. Brewer recently held a press conference on the proposition and underscored the cost of the proposition to the state. We have budget problems enough without further burdening our economy. The League of Women Voters is passing out a “Voter Guide” with some misleading assertions on the issues surrounding Prop. 203. The LVW guide states that the Arizona Senate passed a bill to tax marijuana and that marijuana sales would generate $1 million in the first year. What the LVW fails to tell voters is that the House failed to act on it, so the bill never became law. As it stands today, there is no legislation in place to tax marijuana sales and dispensaries specifically are exempt from income taxes. As I said in the comments on my post on my NPR interview, I understand that reasonable conservatives can disagree on Prop. 112. I consider Lynn Weaver a dear political ally and I want to ensure her views on Prop. 112 are aired as well as mine. On the home page of AZ Political Interviews, you can find my interview with Mike Gular. Mike is the only Republican in LD 16 and I want to encourage every Republican in LD 16 to one-shot Mike and purposefully undervote so Mike gets elected. Any Republicans fully voting and casting votes for a democrat in the house races will only ensure that democrats are elected. This was our first production in the general election. Believe it or not, the ENTIRE thing was shot on a greenscreen. Even the table was covered with a green cloth. David Sipmann of Lightray Productions is a master with digitizing! We’re thankful that he lets us use his studio. If you’re looking for decently priced studio time, contact David via his webpage. Vote a straight Republican ticket. The GOP has some flakes, and there are a few decent folks running against them. That pales next to the combination of incoherence, sleaze and statism now dominating the Democrats who deserve not only defeat but humiliation. The Libertarian Party, which I once led to ballot status in Arizona, has degenerated from a coalition of Objectivists, Heinleinians, real conservatives and genuine liberals to a surly pack of quasi-leftists. They’ve morphed to clueless about the heritage of the movement they represent and often resemble a Code Pink rally. Glenn Beck was responsible for more sales of Hayek’s “Road to Serfdom” in one day than there are current LP members who have heard of it, let alone read it. If the GOP is successful, a certainty in Arizona and other states, they’ll be on strict probation pending behavior modification for past sins. Get ready for 2012. Now the ballot props. 106 – Yes. The “no” argument says shut up and await judicial decisions, a typical liberal elitist argument avoiding the real substance. If you believe it’s wrong for the government to force you to purchase private health insurance, vote yes. If enough people do that in enough places, Obamacare might actually get repealed by Congress. Hearing the voters is part of the process, something liberals are apparently scared to death of. 107 – Yes. Minorities have been impeded, and worse further isolated, by so-called affirmative action programs. Promoters of them claim moral high ground based on noble intent. Reality and ultimate results contradict them. Arguments claiming job losses border on incoherency. 109 – Yes. The argument that it’s a power grab because it transfers decision making from an unelected bureaucracy to representatives we elect is a ludicrous attempt to mask the real opposition which simply doesn’t want hunting to be installed as a constitutional right. 110 — Yes. Selling public lands near military bases has little opposition. 111 —No. If you want a LtGuv, add one. Voters dumped that idea so proponents now want to call the Secretary of State something else. Making that office a satellite of the governor by having them run as a ticket simply further reduces voter choices. 112 — Yes. Petition deadline extension has no real opposition. 113 —Yes. Once again the “shut up and wait for the judge” argument masks the real one. Today’s unions are more interested in the agenda of the leftist coalition they are part of than taking care of their members. Unions fought hard to establish a secret ballot to stop worker intimidation. Today’s union leaders are such losers they want secret ballots eliminated so they can do the intimidating. 203 — No. You might get me if proponents would argue based on the freedom of the individual instead of medical voodoo and the phony belief that legal pot would somehow hurt the drug cartels handling it. Did ending Prohibition really slow down the Mob? 301 and 302 — Yes. If for no other reason that the sick arguments that claim allowing voters to reconsider anything they once supported somehow injures them. 30l allows the money for land purchases to be spent elsewhere while 302 does the same for early childhood education. I support the acquisition of open space and reluctantly will vote yes on 301. I am happy to vote yes on 302 and repeal the allocation of funds to another program that transfers responsibility for raising kids from parents to the state. Should either or both fail, the new legislature should come back in 2012 or earlier via special election with a sunset measure that gives all ballot props allocating funds an automatic reconsideration date. Hear Emil Franzi and Tom Danehy Saturdays 1-4 p.m., KVOI 1030AM. Ballots being mailed illegally, forged ballot requests, felons and illegals registering to vote and pressure on county employees by ACORN like groups. Chicago? Nope. Yuma, Arizona. The Arizona Republican Party has uncovered direct evidence that Mi Familia Vota, Border Action, and Faith.Hope.Vote! who have direct ties to SEIU are attempting to influence the elections in Yuma County through fraudulent means. In the last 48 hours before the Permanent Early Voter List (PEVL) registration deadline of Friday, October 22nd, these organizations submitted 1,328 PEVL requests and then pressured the Yuma Recorder’s Office to process them by Monday. In reviewing all PEVL requests made through what appears to be canvassing efforts by Mi Familia Vota and submitted on Friday, October 22nd, 113 of the 615 PEVL requests processed and mailed early ballots appear to be forged. Investigations revealed that contrary to state election regulations, an untold number of PEVL requests were not signature verified against Motor Vehicle Records, and investigators found concrete instances of forgery among the processed PEVL requests. The Arizona Republican Party investigations continue to uncover clear and direct violations of Arizona law and Secretary of State elections regulations. The AZGOP has an active and on-going investigation regarding the extent of election fraud in Yuma County while allegations of illegal activities that appear to be direct attempts for SEIU to steal the election for Grijalva continue to be reported to the investigators in Yuma. 8,000 new PEVL requests have been processed this year which may have been forged. 10,052 registered voters were on the PEVL as of Wednesday, October 20. 1,536 requests to be added to the PEVL were received by the Yuma Recorder on Thursday the 21st and Friday the 22nd. 376 of the 1536 requests (24%) were rejected for reasons ranging from requests from felons, illegal aliens, and those not registered to vote to incomplete forms and duplicate requests. 113 of a sampling of 615 PEVL requests (18%) by Mi Familia Vota appear to be forged, yet were sent early ballots. 1160 voters were added to the PEVL over the weekend and mailed ballots on Monday, October 26th. An untold number of which were not signature verified and may have been forged requests. Mi Familia Vota and Border Action both used the State Seal of Arizona on their PEVL forms without obtaining permission from the State as required under Arizona law. Thanks to Rachel Alexander, I was interviewed by KJZZ (aka NPR) as a conservative counterpoint to Victor Aranow’s picks (Vic’s Picks) on the ballot propositions. Sonoran Alliance gets a mention in the piece, so, I’m sharing it here. I wish the piece had been longer, but take a listen! Also, Shane appeared on KJZZ today giving his views on the best run campaign, the biggest possible shocker race in Arizona, etc. Hopefully Shane will share that piece with us soon. And here it is featuring political journalists, consultants and pundits from across the spectrum. Funny, Democrat candidate for Treasurer Andrei Cherny is trying to sound like he is a Republican concerned about securing the border in his race for State Treasurer. But his wife is working for one of the most radical left wing pro-open borders special interest group in the country, the National Council of La Raza. 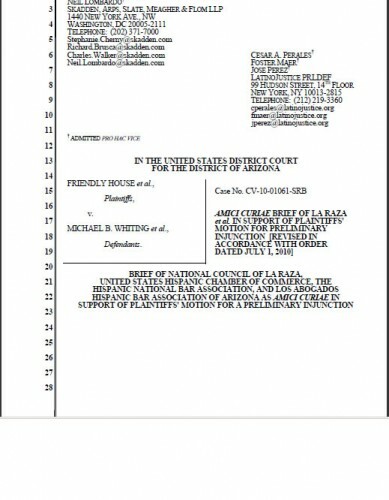 Here is the front page of a brief she filed as their attorney in the lawsuit against Arizona over SB1070. Her name is listed as one four attorneys on the top left side. Seems a bit of a contradiction, to have your husband serving as one of the state’s officers while you sue the state? Not to mention the radical positions espoused by La Raza do not represent the majority of Arizonans, who support SB1070. When Janet Contreras Went Viral! This was Janet Contreras on Glenn Beck’s show in June of 2009. Little did she know that after she got angry with Washington, and inspired millions of Americans, would she jump into the political fire with both feet. On January 8, 2010 after being asked by many supporters, Janet Contreras made it official and launched her campaign to run for Congress against Ed Pastor. After winning her primary race in August on less than ($50,000), Janet now heads to the final hurdle to defeat 19-year liberal Democrat, Ed Pastor. In these final days of the election cycle, please tell your friends about Janet Contreras and her effort to overcome the last Democratic stronghold in Arizona. She still needs money to run more ads on radio – donations can be made at NoMasEdPastor.com. This is our chance for conservatives to make a clean sweep here in Arizona. Let’s get Janet the support she needs to put her over the top on Election Day!